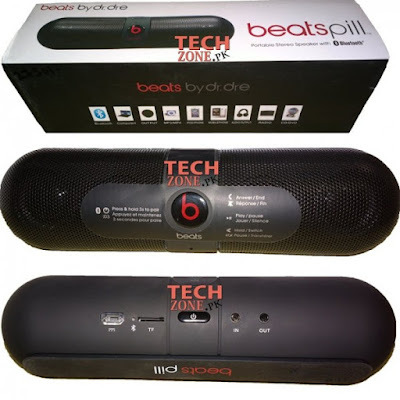 Beats Pill 2.0 portable speaker in Pakistan brings the party with you, wherever you go. The Beats Pill is lightweight, portable, and completely wireless. Change tracks from your phone or take a call with the Beats Pill's built-in microphone. New features include the ability to amplify or stereo your music and accessory charging. Small enough to fit in your hand, the Beats Pill surprises with its powerful, signature sound. Tap. Pair. Play. Pairing is easy. Just tap your phone to your Beats Pill and create an instant connection. Sync two Beats Pills by tapping them together to play the same song. You can also tap the Beats Pills together twice to stereo your music, making one Beats Pill the left output and the other the right. Small Size, Big Sound Despite its compact size, the Beats Pill produces powerful sound. It&rsquo;s easy to enjoy soaring highs and deep, booming bass in every room of the house. The company's mission is to provide a superior end-to-end music experience — with headphones, speakers, devices, and services — so fans feel the emotion and hear the music the way artists intended it to sound from the studio.